When a family friend’s visit turns into something unexpected, the skeletons of a church mother come rolling out of the closet. Rachel’s romp with a lover in her aunt’s kitchen sets in motion a flurry of unexpected events that culminate in revelations for which no one is prepared. no ordinary sunday is a collaborative project that represents the findings of candi’s D.Min. practicum project, “My Side of the Story: My Church.My Voice.” The project’s purpose was to explore how relevant and vital is the Christian church today. no ordinary sunday won an Honorable Mention in the 2010 Ethel Woolson Lab, sponsored by Working Title Playwrights, Atlanta, GA.
After months of sharing personal stories, a diverse focus group determined that their greatest memories from growing up in and around the church are those of family and community. They also expressed a deep concern that the church tends not to address their everyday struggles with practical, contemporary guidance. Read the public report. Festival music drama that tells the story of Jesus’ birth through the life of his mother, “Maria,” who birthed a promise from G~d despite life’s obstacles, including ostracism from family and friends. A four-scene skit depicting themes: “Respect Yourself, Protect Yourself;” “You Can Get a New Man, But You Can’t Get a New Life;” “No Glove, No Love.” “Serenade” was an annual celebration by the Georgia Women Preventing AIDS. Through various forms of art, including drama, GWPA educated black women about Acquired Immune Deficiency Syndrome. Co-author: Valetta Anderson. Performed as a part of Plowshares Theatre’s New Voices Festival. “Questions” delves into the life of Valerie, an African-American college junior who learns she is HIV positive amidst plans for her wedding and accepting honors as Collegian of the Year. 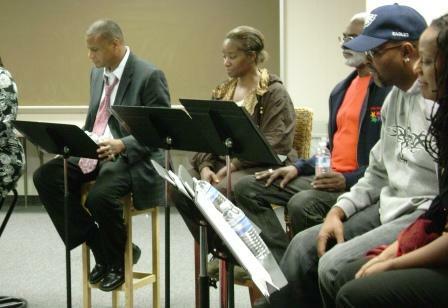 To celebrate Black History Month, through four African-American male defendants, the audience explores several social “crimes.” Charges included: impersonating the good will of a minister, not carrying one’s own weight as an American man, and trivializing the plight and stress of the African-American woman. The audience served as the jury, judging guilt or innocence and imposing sentences. Read an exhaustive list of candi’s scripts in her CV. We look forward to everyone joining our conversations – everyone indeed means everyone!